Norden Kelsang – a 38-year-old nun of the New Kadampa Tradition and a Shugden adherent, who practices in New York – at Saturday’s rally said the demonstrators want religious freedom. But she doesn’t seem to see that this wish contradicts her own statement (and reality) when she says: “We don’t need the Dalai Lama to practice our religion or for us to practice his”. At this point His Holiness digressed to speak about the worshippers of the perfidious spirit Dolgyal or Shugden who had been demonstrating in the street outside the hall as he arrived. They were shouting and waving banners, their faces contorted in aggressive expressions. It was people like these who murdered a good monk and his students as they worked to translate a scripture into Chinese one night in 1997 near His Holiness’s residence in Dharamsala, he said. Today, their slogan was ‘Stop lying’, but the question is who really is lying? Worshipping of anything is not the Buddhist way at all. In that sense, they are both mistaken. That’s muddying the water. I don’t understand the concept of ‘worshipping ritual’. Outside of Tibetan culture, in Buddha’s original setting,he was discouraging the worship of anything. Didn’t he advocate that gods , creation of the earth, what happens after death etc were irrelevant and what he was actually teaching was in the here and now. It’s no different to a roman catholic praying to mother mary when a tibetan does a prajnaparamita puja. Neither of these cam into the original buddhism. the plethora of tibetan deities (they are called deities for a reason you know) are an expression of tibetan culture, not buddhism. The thais have their own forest spirits etc, which have been absorbed into buddhism as has every other buddhist region. You have to look anthropologically, it’s all in human behaviours. No doubt these comments will creat a howl of derision, but hey, the dalai lama has even said we need to move past mere religion into a more secular era. So not only in Tibetan Buddhism spirit worshiping exist, it is also tolerated and does exist in fact in Theravada countries for the sake of giving the masses access to rituals they might need. If you want to establish what the Buddha taught it would be good to use references from scriptures of the Pali or Sanskrit tradition otherwise assuming what the Buddha said becomes an endless talk and I have to do your work to provide reference if what you believe is correct or not but its your job to check and to validate your thoughts by the teachings of the Buddha. How can the Buddha have taught what happens after dead is irrelevant? He taught the realms and levels, about spirits and nagas, and the functioning of karma etc. This is all stongly related to what happens after death too. Neither of these cam into the original buddhism. You lock yourself in if you assume there would be an entity like “original Buddhism” because even scientists say this is a problem if someone does this because what exactly the Buddha taught was started to be written down only 150 years later. There is no certainty that those writings are exactly what the Buddha taught nor that those early writings included all teachings. Not only this, there are countless Dharmas, how can you be sure that what was taught later is not Dharma: an opponent against the mind poisons, lower rebirth and vehicles to the three types of enlightenment which the Buddha taught also according to Theravada Pali texts? It’s no different to a roman catholic praying to mother mary when a tibetan does a prajnaparamita puja. Maybe the person makes through his joy a strong connection with the teachings on emptiness and this forms a sober basis for realizing it? the plethora of tibetan deities (they are called deities for a reason you know) are an expression of tibetan culture, not buddhism. Sorry, you should get better informed, Lupin. The tantras were practiced and validated by practice in such places as the monastery Nalanda and Vikramalashila. It was brought by Indian pandits like Atisha or Yogic Practitioners like Padhmasambhava who was asked to come by Shantarakshita, another Indian pandit, to Tibet. The Tibetans didn’t make the tantras up! You go totally wrong not understanding the transmission of the Sanskrit Tradition of mainly (but not exclusively) those two great monastic and study seats in India to Tibet. In those Indian Buddhist monasteries, followers of the Hinayana, Mahayana and Varjayana practiced and lived together at the same places. Atisha, a fully ordained Indian Buddhist monk and a tantric practitioner, was known for keeping the Vinaya rules from all Vinaya lineages … Tantra and deity yoga is a means to manifest the most subtle mind to meditate on emptiness and to get rid of the mind poisons very quickly, is that not an approach in line with Buddha’s teachings? And if Shariputra could (according to Pali texts) travel to different realms, why should not teachings become manifest for those who have the capacity to practice them? I think you should do your homework first: read the pali texts, academic literature and historic accounts about Buddhism and also the life stories of the Buddha, his disciples and later Buddhist practitioners. Do you think you are more wise than Asanga, Nagarjuna, Atisha or other great Buddhist adepts? Since the Buddha left this earth (400 before Jesus according to latest research) there have been passed 2.413 years, Nagarjuna lived 550 years after Buddha we live even 1.900 years after Nagarjuna, who was closer to the teachings: we or Nagarjuna (who might not have taught Tantras but the Prajnaparamita), and why should Nagarjuna’s teachings on emptiness and Mahayana be invalid and your assumptions be more correct? the dalai lama has even said we need to move past mere religion into a more secular era. Firstly, it’s ‘not my job’ to be poring over your every buddhist word. That’s yours! Secondly, none of these things are real, just developed by human beings to explain stuff. I have read the long and middle length discourses. Nanamoli’s translation and Walshe’s. Both books cost over 40 euros each, so don’t point a finger. I detect anger, Tenpel? I’m unlikely to compare myself with the practitioners you mention above, because I don’t live in the bronze age, I have access to better information and I don’t believe in any of these things. So, it is universal. Scratch the surface of anyone with a belief and they come out fighting! haha! Oh, forgot to say…..if buddha died 150 years before anyone wrote down anything he said, then nobody on earth can speak for him…ever heard of ‘chinese whispers’? Humans have limited capacity for passing on anything heard in its original form. Yet, still fight tooth and nail to preserve all these outdated and ambiguous belief systems….and I mean every belief system, not just buddhism. Buddhism has been transforming because fundamentally all compounded things are impermanent and Buddhism is a compounded phenomenon. I think you might see things a bit different if you go through both articles. You’re still under the impression I’m theravadin, aren’t you? Wrong. I’m not in any box really, I just look at stuff as it appears and make my mind up. Ritual and superstition are not my thing, which excludes all religions from my radar, plus, I love to stir it up. after all, you seem to have lots of time to draft long defences, so why not use my skills to keep you busy? That is why I gave up poring over dusty religious tomes a while back, they’re just circular arguments. Why on earth would I waste my time studying nonsense unnecessarily? So uninformed as I am about bronze age superstition, I can list my real knowledge as PhD MSc BSc RGN CELTA…..but then, this type of knowledge is unimportant to you. I’m not shallow when it comes to what really matters to me, and it’s not buddhism. Enjoy your obsession! No, I am not under impression that you are a Theravadin. I am under the impression that you misunderstand what Indo Tibetan Buddhism is all about and that you do not understand its internal logic. My opinion is, if you want to criticize something in a profound and not prejudicial manner and if you want to be taken seriously by others who are not ill informed you have to understand things and their complex backgrounds and their internal logic first. You feel that I defend Tibetan Buddhism but this is not my aim here. I made this blog to counter wrong or distorted information spread in the internet to empower people with differentiated information in order that they can make up their own minds regarding Tibetan Buddhism and related topics, which is difficult if there is only one-sided or superficial or even mis- and desinformation. I see myself as a victim of the lack of such information that I provide here and on my websites now. So I hope it is useful for some and it enables them to make more informed decisions. Now, if you start to comment here in a way that I think the content of what you comment is incorrect, I will of course pick that up and say what I think about it (as much as my time allows that). If you feel that I defend Tibetan Buddhism, maybe because you want to attack it and then you see my responses as defenses? Now, why do I say this? Is this a defence? Not for me, I give you a background of my motivations and thoughts in order to find a useful basis for communicating. But since you seem not to be interested it is at least for both of us wasted time, hopefully not for everybody who reads this. I am interested in your real knowledge, and I am happy if you share it here. what we believe is never based on our rational system, usually on the intuitive one, so I think beliefs are discountable. However, if you are not here with this website to promote and defend buddhism, why are you doing this? You have already agreed with me that if dharma is as it says, it does not need defending by anyone.Quite a few people ( and higher primates) are programmed genetically to need these systems. Perhaps we should just live out our lives happily and blissfully without them all, without the catholic guilt, the protestant cheerlessness, the buddhist merit counting and the rest. As homo sapiens, we seem to need to belong. Maybe that’s what these religious groups represent. For my part, I stopped needing to belong and try to fit myself into unsuitable systems, so I discarded them all. And I took the time to think what my motivations were before deciding once and for all that I’d rather just be what nature intended (a good bag of compost) after I’m gone than spend my whole life in a state of OCD watching every mantra,puja, ritual etc in case I come back as an animal….when in truth, animals are better off because they don’t weigh themselves down with nonsense, they just live. We , however, are afraid to die. That’s why we have medicine to keep us alive for as long as possible regardless of the consequences to our planet and other species. There are no ‘six realms’…just a good bag of compost. You’ll never get me reading up on any of what you believe. Life’s too short. I suspect, like everyone with an agenda you’ll have to get the last word in, but before you do…here’s a question for you: Why if you are a monk studying in Pomeia , do you need to run a website with all these ‘complex issues of buddhism’? Why not just be a monk? I suspect you too are looking for followers…another guru? And you imply that I think myslef too good for the likes of Atisha et al? Well if I worshipped varous gurus and ignored my own experience, I guess I’d believe in everyone and everything rather than myself. Instead I choose to believe in myself and when I meet nonsense, I square up to it rather than agree to fit in. I rarely read these long winded posts, just skim through them otherwise I’d end up like yourself, quoting an endless supply of counter arguments and authors, and I don’t want to be like that. And today at Santa Clara, reporters were told that protesters were objecting to the Dalai Lama’s “lavish lifestyle.” Is that a new one? Or just one that they know will gather momentum? Given the extraordinary diversity of the cultures in which Buddhism took root, it is no wonder there is still diversity within the various traditions. The historical Buddha, like so many other thinkers in India at the time, took some interest in the world of deities and spirits which formed part of the accepted cultural and religious environment. The present dilemma regarding Dorje Shugden and the Dalai Lama’s stance on the matter is not surprising when reading historical accounts and the present dialogue regarding the status of Shugden. I understand the Dalai Lama, after much reflection and recourse to divination has, after being Shugden practitioner himself, renounced the practice and advised others to do the same. I have read speeches given by the Dalai Lama and can only conclude that his words do relate to a ban on this practice within certain communities. His reason being that Shugden is a harmful spirit. I find it difficult to condone any restriction of religious freedom. The fact that some believe Shugden can bring worldly success is plain. My own view is this form of reliance on Shugden does not help when trying to develop the qualities described within Buddhism. Unfortunately, as history proves, there is always upheaval when a belief becomes a contentious issue, potentially bringing harm to those of the minority view. My earlier reference to English history being an example. The migrations of ‘dissenters’ throughout history are well documented. So the present problems are not new but it is understandable when they cause distress to the minority. As there are now Shugden Monasteries where there is supposed to be repression, I presume there is no problem finding the material support for their continuation. I find it hard to believe these monasteries could function if all Shugden supporters and institutions were totally ostracised. What about the Buddha’s clairvoyance? I have no problem with any scepticism against divination but if you really think this is superstitious you have to apply the consequences also to the Buddha who talked about spirits, nagas, former lives etc. The 14th Dalai Lama himself has taken up the issue several times. His statements on Shugden have been collected and published recently in Tibetan. In order to investigate the canonical status of Shugden and his practice, he applies basically three methodological devices or arguments: (1) historical evidence, (2) political reason, (3) spiritual insight. You find more at the end of the paper by Michael von Brück. As long as you rely on half-knowledge and don’t get the facts together you will be easily fooled by a lack of understanding of extremely complex topics. That’s why I suggested to you in a previous comment that you go through the pali texts, academic research papers and reliable historic accounts. I have done this to a certain degree. That’s why I am at ease with many things that seem to worry you. There is quite a lot of confusion & ignorance that reveals itself in comments regarding the Shugden topic, Tibetan Buddhism, the Dalai Lama etc in the comment sections of newsoutlets and blogs. Its quite sad to see … but its the result of uninformed and prejudice affected minds. The uninformed readers think its correct what there is been said, and jump helplessly on it because they lack a sober background knowledge and so they cannot make use of their brain. Because I love myself and have some self-respect, I wouldn’t allow my mind to go into a similar direction. I am not theravadin, or buddhist, or wasting time re reading stuff I grew out of. Oddly enough I’m a human being, that’s all. Dear Lupin, maybe I am wrong. You have a rather long history here on the blog and also we together by email (since 2011 or so), haven’t you? My feeling is that your attitude changed over time. My impression is that you seem to be in the mode in rather attacking Tibetan Buddhism based on a black and white pattern of thinking. It is only this attitude that I oppose. But maybe I am totally wrong. I have nothing against criticizing Tibetan Buddhism based on knowledge and understanding. I think my blog and websites speak for themselves. The term “Tibetan Buddhism” (a term created by Westerners as they also created the term “Buddhism” just 150 years ago) is not accepted by Tibetans, why?, because they see this tradition as coming from India and not being made up by them. And all in all they are right in this view, that’s why it would be better to use the term Indo-Tibetan Buddhism. Indo-Tibetan Buddhism is often been criticized by a lot of uninformed people, and sadly I also recognize part of your comments as uninformed and superficial. I find such an approach crazy. I can only criticize what I understood in the first hand good enough. Otherwise what I criticize is an attack of my own projections about Tibetan Buddhism and this is just shadow boxing. Such shadow boxing about Tibetan Buddhism is quite spread on the internet, and extreme leftists, right wing people, the NKT and people like Trimondis or Goldner ride well on those self-created waves of their own projections. For me its not about write and wrong but a matter of accuracy and avoiding to project unfairly onto others my own ignorance. If you claim things like ” the plethora of tibetan deities (they are called deities for a reason you know) are an expression of tibetan culture, not buddhism.” than this is wrong and unjust against the Tibetans, why should I accept such statements on my blog? To be fair; I do apologize for not having taken time to respond to your last comments in a differentiated manner and to allow ourselves to go into a balanced, fair and informed discussion about those topics. Instead I suggested that you have to do your work (of getting soberly informed) and I have to do mine (which I claimed to had done to a certain degree). I did this out of a thorough lack of time. The same I did with a recent commentator who still waits for answers here. If you want to have a fair discussion it depends also on you how much you are informed, it depends on both sides. What is real? To make it simple, real are existent things that can be proven to perform functions. If you apply tantra and you are able to manifest the most subtle mind and to meditate on emptiness and this destroys or weakens your afflictions, this meditation technique is real because it functions. That’s the point I wanted to make. It is very easy to throw out all what I said by a phrase “just developed by human beings to explain stuff”. But if you want to get access to a deeper understanding analysis and investigation based on knowledge are necessary. Ok, good. I do apologize that I put you in a box. Nevertheless your basic assumptions about Indo-Tibetan Buddhism I still find superficial, uninformed and unjust. However, to have a fair discussion, as I said, both parties should have sober knowledge or at least open to be corrected. Also, for a buddhist monk, I think you could be quite aggressive and nasty defending your little corner….to what extent remains to be seen in your future posts. I’m sure ‘dharma ‘ being what it is , doesn’t need defended by you, me or anyone. Also, how can anyone ‘be at ease’ with any of these systems which rely on mindless repetition of particular syllables and word patterns in the hope that they can dispel desease, for example , in the case of dear old lama zopa when he had his stroke, Everyone was asked to do 100,000 mantras for his recovery….why not 100,000 physiotherapy exercises? They seem to work better, as I recall. It was good medicine and the efforts of roger kunsang which helped the lama to recover, not mantra chanting or puja recitation. It’s all superstition, from christianity to shamanism and everything in between. Maybe its superstition. Who knows? Even if it is superstition, Lama Zopa Rinpoche is a very compassionate and kind person who works very hard and effective for the welfare of others, including animals. If such superstition like reciting mantras led him to become like that, maybe that superstition is not too bad. Its seems to function for him (and others). I would agree that mantras don’t replace physical exercises. He did both, and others prayed for him. How and if this functions I don’t know. But Lama Zopa Rinpoche seems to see a use in this. Nobody has to follow that example. If I compare some of my Theravada friends with the qualities of some exceptional Tibetan masters (like Lama Zopa Rinpoche), I have to say, I am more impressed and inspired by the qualities of the latter, and I wonder how they attained those qualities. The answer is: through their practice which often includes tantra and mantra. Why not opening up to those practices if they can bring out abundant qualities? I don’t see a need to limit myself by my own beliefs (if mantra recitation is superstitious or not can not be proven easily, so if you judge it as being superstitious or not being superstitious is rather a matter of belief than a matter of facts or proofs, isn’t it?). Tibetans and all other groups are conspicuously absent. Numbers are also down. Weak showing NKT. It is only Kelsang Gyatso’s die-hard students who are still willing to play his pitiful reindeer games. ….and your lot are no more than a pyramid -selling property empire Tashi. Also, I don’t have a long history of personal emails to you only 2 or 3, and of no real consequence. haha! You never printed my last comment as it must have hit near the nerve….so does that make your site a balanced one or an advert for new recruits? my last comment was a rather lengthy debuttal sent yesterday evening. It appeared ‘under moderation’ on my screen. I think you may be lying mr jaeckel, then sending a condescending hug which is likely more to reassure yourself than for my benefit, seeing as it’s superfluous and a bit effeminate for my taste. I suspect that you have fallen prey to that universal bias of confirmation, so anything that does not support your world view has to be swept under the carpet. Well, you’re only human after all, not some deity! All comments must be approved on my blog. As soon as I recognized your new comment, I approved it. I felt there is nothing to add so I didn’t say anything but I was thinking that you seem to be in conflict with religion or Tibetan Buddhism or something else, and it was stupid from my side to argue with you instead of addressing a possible underlying (emotional) conflict. What ever I say seems to stir you up and to be unsatisfactory for you. What else can I do then to send you a smile or a hug 😉 and to leave things as they are? Yes, I’m definitely in conflict with unnecessary religions (ie all of them). Once we evolve a bit further and shed them all we’ll be a lot better off (unless, of course we are in aposition to lose an easy lifestyle funded by needy believers). As you have suddenly become a psychologist and have diagnosed me with some kind of emotional conflict, I suggest you get some real qualifications. I could not be more clear about my lack of conflict. I despise religion, pure and simple and have done since a very young age. No conflict about anything there. My goal is to laugh you all out of the internet and prevent others falling into your many and varied traps. So, now you can have the last word (as religious people need to, for their own ego) and make it as arrogant , condescending and patronising as possible as I now cheerfully unsubscribe! You seem to be one of those militant atheists…. Now this is a blog about a religion. Means it will be frequented by religious people who will discuss religious topics. Now if you can’t stand this topic at all, as it seems to be, then why don’t you go to an atheism themed forum/blog and post there? You have a right to be an atheist, just as other people have a right to practice a religion of their choosing. This blog isn’t about the badness of religion but about certain abusive and manipulative practices that are present in certain groups and not in others. So if you want to rant about religion in general, for whatever obscure reason you feel the need to do that, this is not the place for it, because as much as we leave you your atheism, it’s not up to you to decide what other people are supposed to think about this topic. I would hesitate to say Lupin IS this or that (this I should remind myself too and also Jigje) because IMO it’s always dangerous to pin point an extremely complex phenomenon such as a human being to be (only) this or that. There is always the danger to reduce the complexity of things and to simplify things in a way that finally these labels are unjust, evoke feelings of hostility or hurt others. Although Lupin says that s/he is in “conflict with unnecessary religions (ie all of them)”, when I remember correctly from past comments this has not always been the case as far as I can see. There might be some confusion because Lupin used in the past another user name and I was not consequent in reminding him/her of the rule that we once agreed upon, that user names shouldn’t be changed here on the blog because that has always created some confusion. But all in all I agree, an atheist approach and the aim of this blog do not fit well together, there are better places to discuss the things that are important for Lupin. But I think s/he realized that already as we did too. If peopel like me don’t stand up for reason, you lot will make all the decisions on our behalf, and I for one am not having that! Ah, so you confess that you came here simply for the purpose of trolling around? I don’t make any decisions on anyone’s behalf. Nor do the vast majority of buddhists. That may be the domain of some more fanatic followers of certain other religions. But probably they will ban you after three posts if you act like you do here on a muslim or fundamental christian site, therefor you came to a buddhist site, thinking the dumb buddhists will tolerate your rants about the horrendousness of buddhism and religion in general. I advise everyone, to no longer feed this troll. A spiritual place shouldn’t give this kind of behaviour a stage. Because the more you entertain him with your answers, the more he will enjoy his success of making an idiot of the users that answer him. It’s like with little kids that are in a destructive, provocative mood. They have to be put in their place eventually, for their own good. by your strange little emoticon, which is as usual among your types, condescending, you imply that I might ‘come back into your fold’…no chance! The replies on this site use the same methods that the NKT and other , theistic religions use as soon as rational skepticism is played….’ignorance’, ‘complex metaphysics’ etc…I just heard Ann Widdecombe use that against Stephen Fry in a debate on catholicism…..
honestly you lot! Divination, six realms, hungry ghosts etc…this is not harry potter, this is life! Indeed. But I doubt that is going to happen in the immediate future. As you know, intense negative emotions can take some time to cool down, even if they are not further fueled, and coming to the conclusion that this sort of behaviour was a mistake and changing one’s attitude to more positive also takes some time. After all, one has to overcome one’s deeply rooted narcissistic outlook at oneself and the world, and that’s neither quick nor easy. Desperate, how he tries it again and again to get a reaction, isn’t it? I think patience, love and tolerance is the better approach. This doesn’t exclude to be strict or straight forward nor does it imply to behave foolishly, however, it never is nice to throw stones or judgments onto others using words that puts them down. We have all our own negativeness, narcissistic outlook etc.. Just leave him/her alone. This helps the best to settle. Or as you said: don’t feed it and my addition: don’t throw stones yourself. The Muslims say, if someone says something unpleasant to you, say something nice. Great teaching for me! Oh, aren’t you going to pray for me then? That’s what the christians usually say…same script, different jargon. Yes! I’m here celebrating my freedom from oppressive philosophies! whoo hoo! Never again will I be involved with any of this stuff, the freedom beats any kind of ‘future enlightenment ‘ any day! Bye now, I’ll let you have your last patronising word, it’s all you’re going to get as you’ll end up as compost too! Nobody really needs to be a certified psychotherapist to get that you’re carrying a lot of anger, Lupin, an emotion that destroys true peace of mind or a sense of well-being. Anger is one of those complex, tip-of-the-iceberg emotions that conceals more than it reveals. Quite often it covers up our “core hurts,” i.e., distressful emotions of feeling ignored, unimportant, accused, guilty, untrustworthy, devalued, rejected, powerless, unlovable, etc. Be that as it may, I wonder if it wouldn’t benefit you more to work towards just “letting go” of religion vs. despising it? It would clearly put you in a happier frame of mind and that’s a good thing, no? I came out of retirement to tell you that I’ve been a psychologist. I also happen to think that anyone who believes all the stuff from these religions must need their heads examined. Take your sanctimonious preaching elsewhere….it’s not anger, you can’t hear my vocal intonation…it’s pure mirth and head shaking disbelief that people can be so duped….aren’t your lot always sitting around looking for sponsorship, donations etc so you can continue your lifestyles…same as the clergy from christianity etc…..of course you had to have the last condescending word! Very predictable. So other people pay a personal trainer, for language lessons, riding instructions or some other idle stuff, supporting the life of of that teacher with their money, or they support the building of a yachting club. Some people like to put their money into fitness, a new language, better riding and a place for sport. And others pay for the support of a priest or a temple. I don’t see much of a difference. And spending mony in something that results in more ethical behaviour is certainly better than spending it on the latest totally useless computer gadgets. Is being duped into supporting organisations which perpetuate nonsense ethical? Got you angry as well mate! haha! Having been a psychologist (apparently, not a very good one? ), nothing I’ve said about anger should surprise you. The thing about anger is that it eventually leads to contempt, as well as emotional and verbal abuse. Given your feelings about religion (you “despise” it), as well as some of your comments here, I’d say you’re sadly already there. So, what is it about this whole religion thing that has you unable to let go? What are you getting out of it…. besides mirth? :0) It’s actually you who is generating your own suffering, not those of us here. We don’t have a vested interest in convincing you of anything or trying to dissuade you from having your own opinions. We don’t do evangelism in Buddhism. HaHa! Got YOU angry, didn’t I? Your “read’ of my comment simply reinforces my sense that whatever the circumstances, it’s ultimately a good thing that you’re no longer a psychologist. Anger was certainly not part of my reply to you; compassion would be more like it. Well it may be news to you but compassion etc is not the sole preserve of the buddhist world. Scratch the surface of any ‘believer’ and you get a stereotyped and often nasty reply…. hmmm…anarchists usually want to take over the world and plunge it into chaos (I knew a few an uni)…of couse you’ll dely it, but forum names are dead giveaways aren’t they? …oh, of course! you’re not a psychologist, so you wouldn’t know the unconscious needs that led you to choose that particular moniker! You seem to know a lot about trolls, anarchist! Still make you angry, made you look though! haha! …and I unsubscribed ages ago, so I decide when to look. I don’t have your posts being delivered to my inbox any more! Bliss! 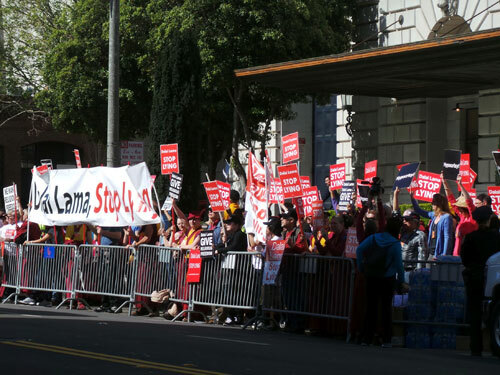 As there has been a resurgence in the protests against the Dalai lama’s ban on Shugden within his communities, I have noticed many posts on my Facebook from a Friend promoting the protests. When he quoted the right to practise religion, freedom of speech etc.. I reminded him of the sacking of Lucy James who lost her post as NKT Resident Teacher for exercising her right to freedom of speech. Following this I posted pictures of the same teacher demonstrating against the Dalai Lama. Within a few minutes my Friendship status had been revoked. So much for my right to express my mind. I am not naïve enough to expect that I remain able to express my opinion where it is not wanted so I am not surprised. Unfortunately, the Shugdens should expect to be ostracised if they do not follow the wishes of the powers that be. I do not condone any action which offers violence etc. to those who do not conform. In a way if Dekyong or Shugden-pas believe in Karma, also experience of being oppressed is their karma, isn’t it? Of course, ‘attaining enlightenment is very simple’. It only takes many lifetimes!